This stunning, classic solitaire engagement ring dazzles with a traditional, round cut 1/3 carat diamond displayed in a modern, dramatic setting with a 14k white gold band. The center diamond comes with independent certification. 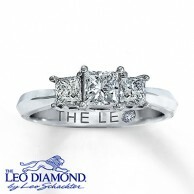 Three princess cut Leo diamonds are given the spotlight in this beautiful engagement ring. The 14k white gold band provides a shiny backdrop to your diamonds, which are secured with platinum prongs for maximum durability. Total diamond weight in this ring is 1 carat. A unique and beautiful design graces this budget-friendly engagement ring. 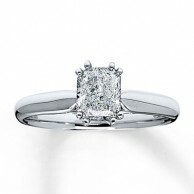 A princess cut diamond sits in the center, surrounded by a square halo of round diamonds. The 14k white gold band twists once over itself on each side, and is further accented by more pave diamonds. This engagement ring with an antique flair features a marquise cut diamond and intricate details that make this ring a sophisticated beauty. The 14k white gold band has diamond sidetones embedded within and engraved milgrain scrollwork accents. 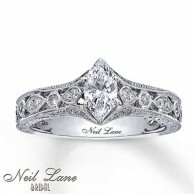 Total carat weight of the diamonds in this Neil Lane ring is 3/4 carat. This elegant engagement ring features a round "Vanilla" diamond in the center, surrounded by halo diamonds, and accented further by more diamonds decorating the band as it splits into two and then reunites. Chocolate diamonds accent the inside of this engagement ring from Le Vian Bridal, bringing the total diamond weight up to 1 1/4 carats. A princess cut diamond graces the center of this brilliant ring, and is accompanied on the sides by additional princess cut diamonds channel set into the 14k white gold band. Total weight of the diamonds in this ring is 2 carats. 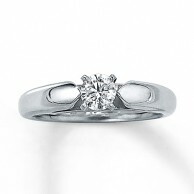 A 1 carat radiant cut diamond sparkles beautifully at the top of this 14k white gold solitaire engagement ring. This ring is good for someone who wants a less common diamond shape -- the radiant cut is gorgeous and different than the traditional round diamond. 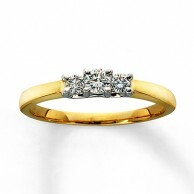 This ring showcases a brilliant 1 carat diamond on a 14k yellow gold band. The colors of the gold and diamond contrast perfectly and create a stunning visual display. 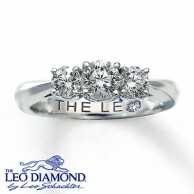 Three gorgeous Leo diamonds sit at the top of this ring, sparkling above the 14k white gold band. Each diamond has been independently certified, and is held securely to the band by platinum prongs for maximum durability. 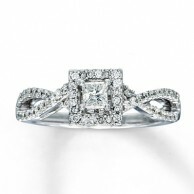 A beautiful princess cut diamond is the centerpiece of this engagement ring. Additional princess cut pave diamonds decorate the 14k white gold band and add additional sparkle on either side of the main diamond. 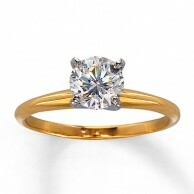 Total weight of the diamonds in this budget-friendly ring is 1/2 carat. 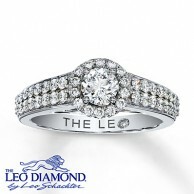 This ring starts with a round Leo diamond in the center, surrounded by a ring of halo Leo diamonds. The side of the 14k white gold band is set with double pave Leo diamonds for even more sparkle. Total weight of all diamonds in this ring is 7/8 carat. The sides of this engagement ring are decorated by three rows of diamonds: two outer rows of white diamonds and one row of chocolate diamonds in the center. The inside of the band features a circular design to add an extravagant feel, and the center diamond is decorated by a "V-neck" collar of diamonds that slopes down around the basket supporting the center stone. Total weight of the diamonds in this ring is 1 1/4 carats. 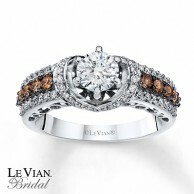 This ring is part of the Chocolate Weddings Collection by Le Vian Bridal. Stunning engagement ring with a beautiful twisted band design. Every inch of this setting has been carefully detailed to add maximum sparkle and splendor. The sides of this setting are twisted into an infinity shape, set with additional pave diamonds, and given finely detailed edges. Surrounding the center diamond is a halo of diamonds, along with intricate detailing around the edges. 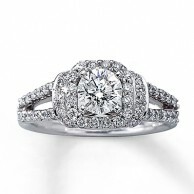 The round diamond in the center is emphasized and showcased by the halo and pave diamonds. Total diamond weight in this ring comes to 5/8 carats. 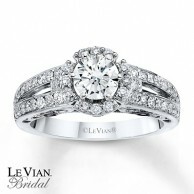 Stunning engagement ring with beautiful sparkling details everywhere. A .75 carat diamond sits in the center as the main attraction and is immediately surrounded by halo diamonds to add additional splendor. An "V-neck" (see the side image!) row of diamonds decorates the connection between the center stone and the 14k white gold band. The band is split at the top make even more fantastic with pave diamonds. Total diamond weight is 1 1/3 carats. Three sparkling diamonds create a gorgeous centerpiece, with additional channel-set diamonds decorating the 14k white gold band. The diamonds on this beautiful engagement ring total 1.5 carats. 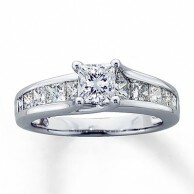 This engagement ring features three beautiful princess cut diamonds set in a gorgeous 14k white gold setting. Total diamond weight is 1 carat. Beautiful, unique three-stone engagement ring in white gold with a princess-cut Leo diamond in the center and round Leo diamonds on either side. Total diamond weight is 7/8 carats, and the center diamond comes with independent certification. 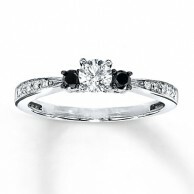 This unique, budget-friendly engagement ring features a round-cut diamond in the center and 2 Artistry Black Diamond sidestones to create a beautiful contrast. 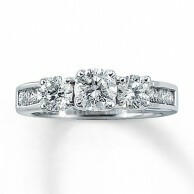 In addition, extra diamonds are pave-set in the white gold band to add even more shine to this setting. Total diamond weight is 3/8 carats. 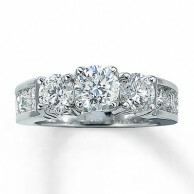 Stunning three-stone round diamond engagement ring with additional channel-set pave diamonds lending additional sparkle. 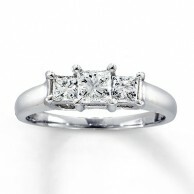 Total weight of all diamonds set in this beautiful 14k white gold setting is 3 carats. This spectacular ring features a princess-cut Tolkowsky diamond in the center, surrounded by halo diamonds, and the 14k white gold band is decorated with pave diamonds and intricate milgrain detailing. Total diamond weight in this ring is 7/8 carats, and the Tolkowsky diamond in the center comes with a certification for authenticity and quality. 3 sparkling princess-cut diamonds grace the center of the engagement ring, followed by pave diamonds set in the 14k white gold band. 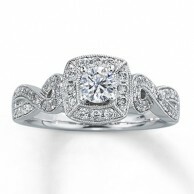 Additionally, milgrain engraving accents the band and adds intricate detailing to make this ring even more spectacular. Total diamond weight is 7/8 carats. 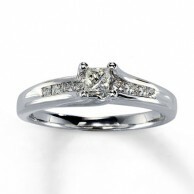 Gorgeous setting in 14k white gold that features a synergistic blend of styles to create a beautiful engagement ring. 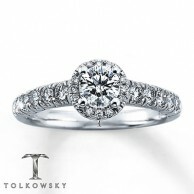 A Tolkowsky round diamond sits at the top of this ring, surrounded by two additional round diamonds on either side. Further down, channel-set diamonds make this ring complete. In all, this ring contains 5/8 carats and comes with a certificate of authenticity for the center Tolkowsky diamond as well as a independent certification. 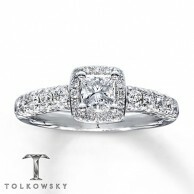 This diamond engagement ring ring revolves around the stunning Tolkowsky Princess Ideal Cut diamond in the center. Pave diamonds decorate the sides of the center diamond, and continue down the side of the white gold band to add additional flair to this ring. 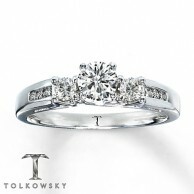 All the diamonds in this ring total 1 carat, and the center diamond comes with certification. 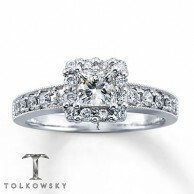 This engagement ring starts with a gorgeous Tolkowsky diamond in the center. 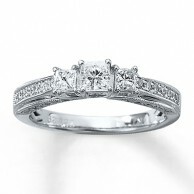 Then, it's accented with pave diamonds all around -- circling the center diamond and also adorning the white gold band. All diamonds in this ring are round, totaling 1 carat in diamond weight. 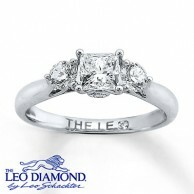 This ring also comes with a certificate of authenticity for the center diamond.